Response 2-0-6 contains a comprehensive nutrient package that includes nitrogen, potassium, magnesium, iron, manganese, zinc, copper, boron, molybdenum, cobalt and silica. 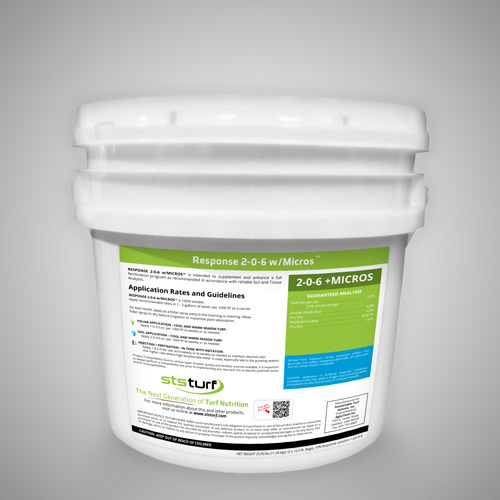 Response 2-0-6 was designed specifically for turf grass to optimize performance, color and health. STS uses only the highest quality organic components, then pre-digests them, resulting in a turf health package that delivers stabilized and complexed primary nutrients, fully chelated secondary and micronutrients, along with vitamins, enzymes, and other plant beneficial compounds. Specifically formulated for turf grass, incorporating proprietary complexing and chelating technology that uses pre-digested and readily available organic compounds to maximize energy. Optimum “Response” and longevity through efficient chlorophyll formation, while also assisting with the manufacture of carbohydrates, amino acids, and complete protein production. Reduces the number of spray tank inputs needed. Injection/Fertigation Rate / Acre 1.0 - 2.0 lbs.